Airing My Laundry, One Post At A Time...: Freaked. “I don’t like the way it’s looking at me,” I told Tom. “It’s a doll. It’s not watching you,” he answered. I walked to the corner of the room. “It’s still watching me.” I went to the other corner of the room. “Still watching me. I’m traumatized.” I hid my face. I backed away as if it were possessed. What if it was possessed? 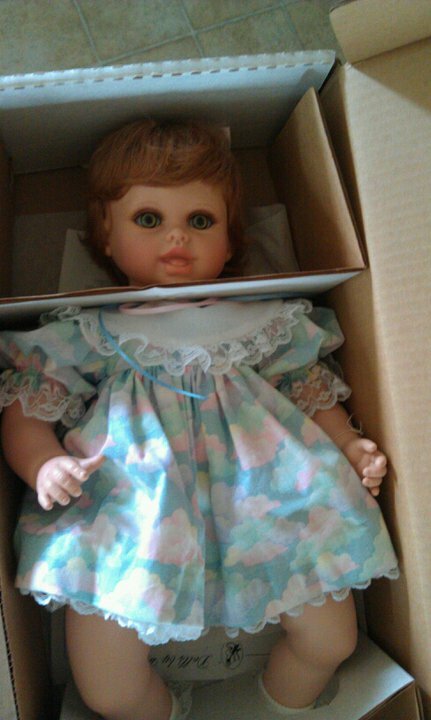 It looked like it would be exactly the kind of doll that would be possessed. I shuddered. I know people collect dolls. I remember watching a show awhile back about women who buy dolls that look like newborns and they treat them like children. Personally, those types of people belong in a VC Andrews novel but that’s just my opinion. And plus, her hair looks red. Red was the color of Chucky’s hair. Remember Chucky? The satanic doll killer? I’m sure it’s just a regular (freaky) doll. Still, to be on the safe side, I covered the box with a blanket. Just to, you know, suffocate it. I'd have been freaked out too. I once found some Hello Kitty dolls lurking in the top of the closet in my room, I still can't deal with Hello Kitty. I'd keep it covered too. I swear I wake up each morning and find Buzz, Woody and Jessie in the exact same position the were left in. awfully suspicious! that is a little creepy looking. Good call on the blanket! haha! I've always been creeped out by dolls, too. We got T one for her birthday, and I couldn't decide which was least creepy, so we went with one that looks pretty real. Which was possibly the creepiest thing to do! I have to reapply my mascara now, because I was laughing so hard I started to cry!!! I'm still laughing!! I love you and your blog!!! If you ever want to find a great networking site come over to VoiceBoks.com we are a great commuinity and you would be such an asset there!! (I get nothing from the group from saying this, it is complelty free, I just really love it and selfishly want my favoirte blogers there!!) Take care, I would keep the blanket on the box and light a candle!!! Oh my! That doll just sent a chill up my back! I would have to hide it while no one was looking. Creepy! That doll would be in the donate bin so fast! You can not be too safe. You did the right thing. Dolls freak me out too.....except Barbie of coarse! YIKES! Did you hear that?! Just now. Something like labored breathing. Listen. *pause* O-oh, what if she's NOT dead?!?! RUN FOR YOUR LIFE!!!!!!! LOL......so very funny I feel the same way. No dolls in this house. Maybe the shed would be a better place for her ?? There was a weird clown puppet doll that used to be in our room and it just had to go - spooky. Oh, that is creepy! Thanks to Chucky, I am still afraid of creepy dolls to this day. I feel your pain...I can't take dolls either. If my daughter wants to collect something, it will be toy trucks along with her brother. Those things are not coming into my house! too funny! it is kind of creepy! You have to tie a rope around the box, if she wants to get you she can just lift the lid and blanket. As a child, I had a gorgeous doll collection...all on stands. One day, I suddenly became terrified of them. So, I moved them all to my little sister's room. Ha Ha! True story. She cried and cried. OMG, I was totally thinking of Chucky and than as I read further you mentioned him. I haven't been the same since seeing those damn Chucky movies, esp the one where he takes a bride. Really? A serial killer doll who takes an evil bride. You're not imagining anything. Better to be on the safe side. Hide that doll...far, far away. That doll is seriously scary looking. I don't blame you one bit if the doll "accidentally" gets broken. I wouldn't put it on MY shelf, put it that way. HAHAHA! What is it about grammas and creepy dolls??? My hubby's grandma gives our daughter these creepy dolls. The difference is they creep my hubby out just as much as they do me, so we keep them all in the closet and crack jokes about selling them on ebay. nor.. old portraits i TOTALLY feel like they (the people) are staring at me.. judging me! Why do grandma's insist on these dolls?! We have one very similar, well, two dolls. They are kept in the closet, under a blanket, and blessed weekly. Is there a lock on the outside of the closet door? I'm freaked out too! Heeeeey now! No hating on the red hair. But, in all honesty, that doll is possessed. Please be careful. Freaky! I received a couple of dolls like this from my grandmother when I was a child, and they weren't allowed to cross the threshold of my bedroom. My little sister, on the other hand, received regular old fun American Girl dolls. She wasn't interested in trading, either. Good thing I wasn't big into baby dolls. Whatever you do...DO NOT watch the clown doll scene from Poltergeist. I once toured the house of a women who collected antique dolls. There were dolls in every room, dolls on every table top, dolls on every bed, dolls in every corner, dolls on each step of the staircase that led to - you guessed it - MORE dolls. It was the creepiest thing I've ever seen and you have my complete understanding and sympathy. OMG dolls like that freak me out too!! So did Chucky. Ha, my grandmother collects those too and they are always creepy. The best is my cousin has one that we call spooky baby. We would torture my younger cousin with by putting it in her bed. Now spooky baby travels the world like that gnome in the commercials. Torturing us all in knowing that we can't escape spooky baby. I've never been a fan of those kinds of dolls either. I used to clean house for a lady who had some and I swear they watched me as I cleaned. I always RUSHED through that room! ..why am I reading this post before I go to bed??? I don't blame you for being freaked out. I think it's looking at me too. Dolls can be pretty damn scary! It does look exactly like the kind of doll that would be possessed. Creepy! That doll needs to get out of your house, like, yesterday. It's staring at me thru the computer screen!!! I'm off to get some holy water and garlic. Dolls like that freak me out too! HILARIOUS! I used to have a similar doll as a kid, I loved it so much its hair came off...my mom gave it to me a few years ago and I was seriously disturbed by it. now it's in a garbage bag (suffocating) in the hall closet. Your hilarious! I saw that show with the lady who carries around real looking baby dolls! Definitely disturbing, though I can see why this doll is staring you down. The way the box is, it looks like she's on a guillotine. I was so creeped out by those movies about CHUCKY...the mass murdering doll. Yours looks like a relative of his.